Being a parent you commonly witness horrible experiences when suddenly your child starts screaming and crying. He may also throw things, swing and kick hands or legs and bang his head. This is called a temper tantrum. It is a normal phenomenon in a child’s growth and development. It is a sudden outburst of unpleasant emotions such as anger, frustration and irritation due to the challenges of the daily learning process. Tantrums are common in children between 1 to 3 years, especially when they start developing language skills. Hyperactive and moody children are more prone to it. A child shows tantrums when he/she is hungry, tired, sleepy or wants something. Every child is a curious learner. Anything that interrupts their learning process or their independence makes them frustrated. Your child may also throw tantrums to test your patience and to know how long it takes you to surrender to his wish. A child learns to deal with temper tantrums as he grows. 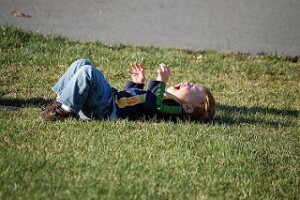 A tantrum may cause embarrassment and put parents in a distressing situation. It is very important for parents to learn how to deal with it. Remain calm- When a child throws up a tantrum his mind is upset. If you scream or yell he/she won’t listen. Instead, the child would react in a negative manner. Your anger will complicate the situation. By spanking your child, you will set a wrong example. Stay with your child– Ignoring temper tantrum sometimes helps, but leaving your child alone is not a good idea to deal with it. Your absence will make him feel unwanted and lonely. Stay and try to distract your child. If you are unable to keep yourself calm, leave the room, but make sure someone is there for the child. Figure out the reason behind the tantrums- Your child may be hungry, sleepy or unable to complete his task. If his demand is reasonable, fulfill it and help him to complete his task. Don’t give up to unreasonable demands- If you think that giving the child whatever he wants is the safest way to deal with temper tantrums you are wrong. The child will learn to throw up tantrums whenever he wants anything in future. How to deal with temper tantrums if a child tries to hurt himself– Take the child to a safe place. Stay there until he/she calms. Make sure the place is boring so that urge to leave the place calms the child soon. Embrace and talk to your child– Embrace your kid or hold his/her hand. Once the child calms down to talk to him and help your child acknowledge his/her frustration. The best way to deal with temper tantrums is to avoid situations that may trigger them. Give attention to your child and give him/her independence to explore and learn.